Obama’s speech at the Democratic National Convention was absolutely incredible. Truly inspirational. His oratory skills are unparalleled among presidential candidates since the days of JFK and RFK (although Clinton and Reagan were pretty damn good). Also, I’ve never seen an elected look better in a pink tie (apologies to Mayor Villaraigosa). He even talked about renewable energy, climate change, water quality and lead free toys. By the end of the speech, I was ready to run through walls. I was even ready to apply for any available job in his administration, including those guys at Homeland Security running the metal detectors at LAX. Obama inspired the listeners and viewers to want to be part of history. However, after further reflection, I thought about the guy on stage before him. No, not Michael McDonald. I was never much of a fan of the Doobies. I’m talking about Vice President, Oscar winner and Nobel laureate, Al Gore. The contrast between the two speeches was striking. Yesterday, Orange County District Court Judge Thierry Colaw issued a ruling on the Arcadia II case that restored water quality protection for the Los Angeles region. The environmental community (NRDC, SM Baykeeper and Heal the Bay) disagrees with the conclusion that the Los Angeles Regional Water Board’s water quality planning is flawed, and we are evaluating our appellate options. 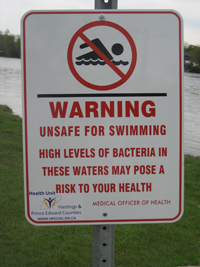 But the critical bottom line is this: Clean water standards are in place and enforceable once again to protect the public health of millions of beachgoers and to safeguard aquatic life in the Southland. The Georgia Aquarium welcomed a juvenile, 9-foot manta ray to its 6.2-million gallon tank this week. This is the same aquarium that had two whale sharks die on them last year. 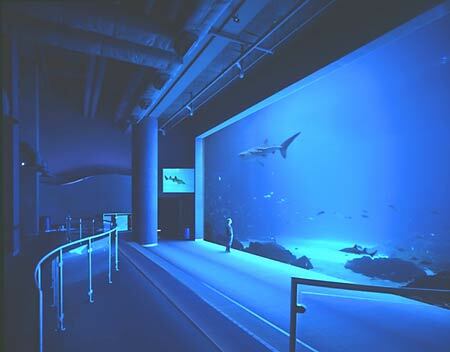 The Atlanta-based fish tank also charges folks nearly $300 a pop to scuba with the world’s largest fish. The manta, named Nandi, will share the tank with the two 13-to-15-foot long whale sharks: Yushan and Taroko. Clearly, the home ranges for the cartilaginous leviathans is a hell of a lot bigger than the ginormous fish tank, yet the trend to capture and display some of the world’s largest animals continues. Last night’s speech was the best I have ever seen Senator Clinton give, and I’ve seen quite a few. On top of the passion and compassion that she expressed so eloquently, she provided more than lip service to the issue of the environment. I was thinking about posting on the Las Vegas over-under for mentions of the environment at the DNC. My bet would have been three, but Hillary blew that out of the water last night. The Santa Barbara Board of Supervisors went and did it. They voted 3-2 last night to ask the Governor to open up the Santa Barbara County coast to expanded oil drilling despite the opposition of stalwart environmental leaders like Pedro Nava, Susan Jordan, and Linda Krop and the Environmental Defense Center. In the early 1900s, philosopher George Santayana warned: “Those who cannot remember the past are condemned to repeat it.” Evidently the S.B. supervisors have the attention span of a Nickelodeon obsessed tweener or they are in the pockets of Big Oil. The spin around the story is that the vote was largely symbolic. After all, Gov. Schwarzenegger, Sens. 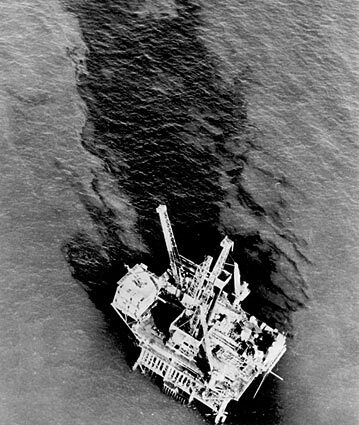 Feinstein and Boxer are all staunch opponents of offshore oil drilling. But I think the spin underplays the symbolism of the county’s move. Recently, our friends at the Save the Plastic Bag Coalition sued the City of Manhattan Beach for their plastic bag ban. Led by their bombastic attorney with the affected English accent, Stephen Joseph, the chemical industry and plastic bag manufacturers sued the city over alleged violations of the California Environmental Quality Act (CEQA). Supposedly, the city’s 100+ page staff report didn’t adequately address alternatives to banning the scourge of the marine environment. Clearly, the plastic and chemical industries are feeling their oats. They successfully killed the bills that would have kept the carcinogen BPA (bisphenol-A) out of baby bottles and sippy cups (that will teach those babies to cry), and would have eliminated PFCs (perfluorinated compounds) in food packaging like microwavable popcorn (YUM!). Now the American Chemistry Council is stirring up a backlash to the Seattle 20 cent per bag fee. They’ve even gone to the extraordinary measure to pay individuals two bucks to sign a petition repealing the bag fee. 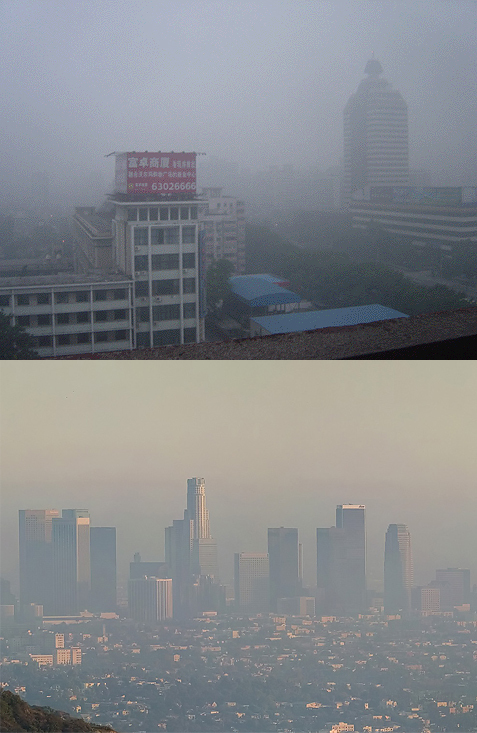 Beijing (photo: Bobak Ha'Eri) & L.A. Looking in the mirror. The Olympic flame was lit 10 days ago at Beijing’s Bird Nest. Since then Michael Phelps won an unprecedented eight gold medals in the Water Cube and the sport of China-bashing for its environmental damage and devastation has been in full swing. We all have been made aware of the facts about China’s pollution; number one in the world in greenhouse gas and ozone depleting chemical emissions, 1000 new cars on Beijing’s roads every day, two new coal fired power plants go online every week, air and water pollution that has led to a cancer epidemic without precedent, the loss of the visually breathtaking Three Gorges to a colossal hydroelectric dam, a looming water scarcity crisis that could affect hundreds of millions of people and led to the construction of the massive South to North Water Project that dwarfs the California Water Project and brings water from the Yellow River to Beijing. The speed and magnitude of China’s environmental devastation has caught the world off-guard. When the Ehrlichs warned the world of the perils of overpopulation and the pending apocalyptic consequences, everyone turned to China because of their 1.3 billion people. When China took the unprecedented step of government-mandated limited population growth, many foresaw a crisis averted or at least tempered.